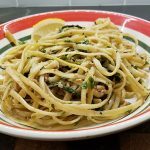 Linguine with Tuna Arugula Anchovies and Capers | What Goes with What? Have everything prep and ready to go as this comes together pretty quickly. I’m thinking you could use domestic tuna packed in oil to save a few dollars as tuna is not a major flavor component and melds with all the other flavors. I might consider 7 oz. of arugula if you want more flavor from it. Just a touch of spice in the background from the pepper flakes and you really don’t want any more, you could use a few drops of Sriracha instead. Bring a large pot of well-salted water to a boil. Add pasta and cook until it is just under al dente, about 7 minutes. Drain, reserving 1 1/2 cups of the pasta cooking water. While pasta cooks, make the sauce: Heat olive oil in a large skillet over medium-low heat. Add garlic and red-pepper flakes and cook until garlic is pale golden, about 1 minute. Add anchovies and capers and cook until anchovies have melted and capers begin to brown slightly, about 1 to 2 minutes. Turn heat to medium. Ladle a 1/2 cup of reserved pasta water into the skillet and bring mixture to a simmer. Cook until mixture is reduced by about half, about 2 to 3 minutes. Add in arugula and ladle in an additional 1/2 cup of pasta water, tossing together until wilted. Increase heat to medium-high and scoop pasta directly in to the skillet tossing with sauce until well coated. Add tuna to pasta and toss again until it is just warmed just through, about 1 minute. Ladle in an additional 1/4 cup pasta water or more, to loosen up sauce and toss again. Sprinkle parsley over pasta and toss again. Season with salt and pepper. Serve in bowls, with flaky salt, a squeeze of lemon, additional parsley and red-pepper flakes, if desired.